COMPARED to some folks I’ve not been away on many foreign holidays. Indeed, it’s only in the last few years that I’ve really managed to get abroad on a regular basis. As a youngster (which wasn’t exactly yesterday!) we’d always go on holiday in England. Hastings in East Sussex was a real favourite with my mum and dad. My parents were reasonably interested in history, heritage and culture and I can still recall visiting the likes of Hastings Castle and Battle Abbey. We’d also walk for miles across the Fairlight Glen and take a look at the famous fishermen’s huts. I subscribed to this view for a long time. OK, we don’t get the weather, but what’s wrong with holidaying in Britain? Like my folks, I’m really into history, heritage and culture – and we have it in spades! So what if we had to endure the odd deluge that lasts all ‘Summer’?! Now I’m much older (but sadly not any wiser!) I can see the attraction of a couple of weeks of unbroken sunshine. It does wonders for my aching muscles and bones. No wonder my grandparents began going on their annual week-long package holiday to Spain during the 1970s. They always had a great time and came back with tales of lovely weather, food and drink. Therefore, for the last couple of years, Majorca has been our place of choice. But this year we decided to go to mainland Spain. 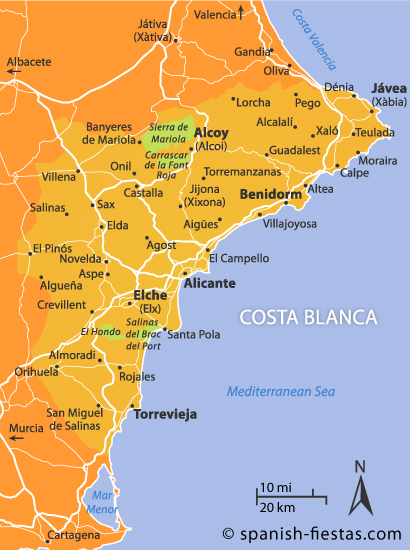 Therefore in early September, some of my extended family and I spent a fortnight near Allicante on the Costa Blanca. The lure of sun, sea and San Miguel was just too much to resist! 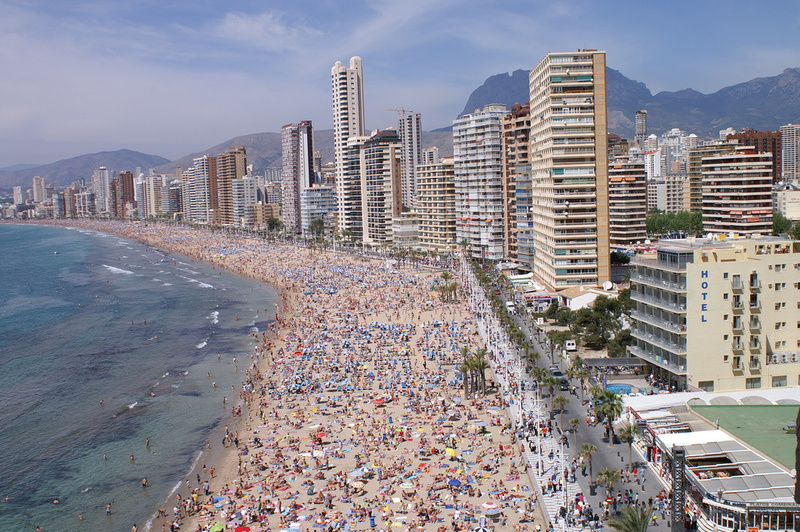 Whilst staying near Allicante we decided, on a whim, to visit Benidorm for the day. I’d heard a lot about this popular holiday resort – good, bad and indifferent – and I wanted to see what it was like first hand. Our snap decision to visit Benidorm put us at a slight disadvantage as we didn’t have any time to find out what the general area was like, look at maps or check out what was on. It meant that we didn’t know the lie of the land or what was where! Sadly, my first impressions weren’t great. It appeared very claustrophobic – I’ve never seen so many tower blocks in one place in my life! It seemed as if the whole of the front consisted of high rise hotels that were crammed cheek by jowl together. Benidorm also appeared very brash to me. To quote my mum again, it would be very ‘Honky Tonk.’ I presume it’s a case of what you see is what you get – something like Blackpool with sun! And talking about the sun, it reached a blistering 38 degrees on the day we visited. Maybe the extreme heat added to my discomfort? Walking around made me realise how ‘British’ the place was. It might be an exaggeration, but along the front every other bar, café and restaurant appeared to be British (or Irish.) The flags of the ‘Home Nations’ could be seen everywhere. Accents, tattoos and football tops also gave the game away! There were also several English language papers available – Costa Blanca News, The Weekly Buzz, RTN Benidorm and Round Town Times. No wonder so many Brits feel at home here! One thing in Benidorm’s favour, however, was the sheer number of places where you could get a bite to eat or a drink. Some streets we wandered along just seemed to be full of outlets selling every drink and dish under the sun. The range of food and drink was impressive to say the least. One thing’s for sure – you’d never go hungry or thisty in Benidorm! With this in mind, I can see why many folks choose it for stag and hen parties, ‘jollies’ or just going on individual benders. In fact we saw one tourist weaving along just after 1pm who looked slightly (to say the very least!) under the weather. I’m still not too sure what he was ‘under the influence’ of – but he didn’t look like he knew what country he was in, let alone what time of day it was! I wouldn’t have liked to woken up with his headache the next day. Another thing in Benidorm’s favour was the number of shops which sold everything you could ever need. It would have probably taken a couple of weeks alone just to have a good look around the Old Town. I was also really surprised at how cheap some items were – even in what appeared to be the really ‘touristy’ areas. Like many people we’d seen ITVs popular series Benidorm and half expected the place to be completely awash with mobility scooters! However, we didn’t see that many. We actually admired some of the double seat mobility scooters and had a good chuckle at some of the ‘driving.’ Indeed, one OAP looked like he was trying to emulate a Hells Angel on a Low Rider! On the whole we had mixed feelings about Benidorm. To some extent, we got the impression that it was a ‘plastic’ version of Spain. However, it’s easy to see why thousands of ordinary working class Britons head there every year. The familiarity of a Full English breatfast, Ulster Fry or Fish and Chips would be a instant hit with many folks. Combine this with Priemiership football on massive TVs and ex-X Factor contestants providing entertainment in various clubs and bars and you’re onto a winner. However, much of this was of no interest to us. We’re not fantastically into popular ‘culture’ and usually prefer the peace and quiet of rural areas. Our family is more inclinded towards true history, heritage and culture and love to see – and sample – local ways and mores. To us, Benidorm had just about enough to remind us that we were in Spain. To be fair, I’d heard it described as Blackpool – what you see is what you get – with blistering sunshine and I think that this is a very apt description. I hope I’ve not been unduly harsh on Benidorm. I realise that you can’t judge a place in one day – and obviously there was much, much more to see. I’d like to go back sometime in the future to explore more of the area and hopefully come across the real (Spanish) Benidorm.